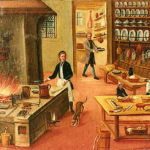 Today we’re going to travel through time and take a look at the history of kitchens. Breaking bread is such a time honored and valued tradition that it has given a special relevance to this space where we congregate and socialize with our loved ones. But it hasn’t always been such a pleasant environment, this room has traveled down a long and winding road throughout history. Sometimes being part of the only room in a dwelling, while at other times being in the back of the house as far away from guests as possible. Although we know very little about Ancient Egypt, the hieroglyphics, tools, and pottery discovered over the years have left us a general idea of what their kitchens looked like, and the tools that they used. 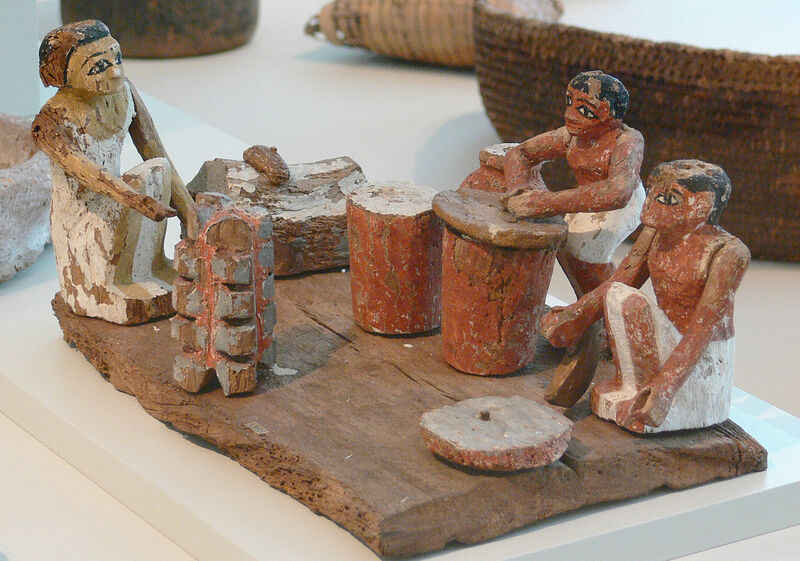 As is often the case, the kitchen was a crucial aspect of Ancient Egyptian culture. Its shape and size was very different from one house, temple, or palace to another. Sometimes being the only room in a tiny home, other times being a large area inside of a palace. The tools used by the Egyptians were quite simple. They employed hearths, ovens, mortars, metal blades, vessels, stone and clay urns, baskets, pans, plates, pitchers, sieves, and pestles for grinding. They used these tools to make meals such as bread, beer, wine, meat, kababs, stews, fowl eggs, and more. But they primarily consumed bread, beer, and vegetables. Peasant Romans usually lived with their whole family in one small room. Much like the poor working class of Egypt, they didn’t have a separate room for their cooking area. As a result they cooked on a brazier in their room, or bought food from street vendors, already cooked. Alternately, slightly more well off Romans who could afford a space big enough to have a courtyard and had the luxury of cooking outside, weather permitting. Their braziers were portable so they could easily move their cooking area from outside to inside. Wealthy Romans had kitchens in their houses, but they didn’t cook in them themselves – they had slaves to cook for them. Because of this, Roman kitchens were tiny, cramped, and in the back of the house where nobody would see them. These kitchens usually had clay ovens, with a burner on top similar to our stoves, except it was heated by a charcoal fire (see picture #2). 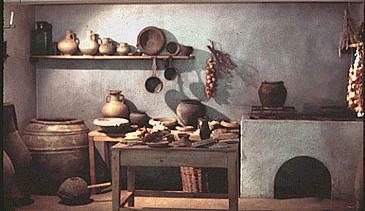 Sometimes they had wooden cupboards to keep the dishes and food in and they had racks on their walls for pots and pans. Romans sometimes used flues inside their walls to draw smoke out, but chimneys only appeared in large dwellings such as castles in the 12th century. The earliest extant example of a chimney is in 1185 at the Conisbrough Castle in Yorkshire. For the peasant cooking was done over an open fire of a one room home, just like the peasants in our last two sections. Life revolved around the cooking area because it was the source of light, heat, safety, and of course, food. They would often use a hearth, smoke rose through a louver. A louver is a domed ventilation structure on a roof that could be closed by pulling strings, like Venetian blinds. Wealthy individuals dined in their great halls, some of which had chimneys and others did not. Although the chimney was invented in 1185 the internet wasn’t around quite yet so it took some time for word to spread. 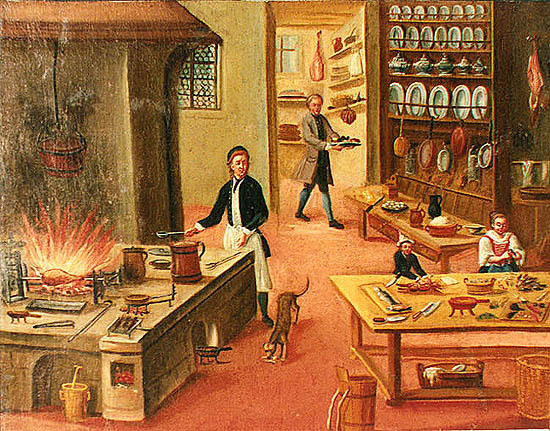 Medieval Castle kitchens were a different beast all together. They were placed outside of the Great Hall for fire safety. With spits roasting meat and large, iron cauldrons bubbling with soups and stews. Lambs, cattle, pigs, and ducks were tethered or penned nearby, some castles kept a pond stocked with fish. Herbs and vegetables would be grown in nearby gardens. Castle kitchens could be large enough to roast up to three whole oxen at a time, with feasts often reaching epic proportions. Here we saw a rise in the french style of cooking all over Europe and North America. This meant strict etiquette, sophisticated dishes, and formal table settings. Servants played a large role in the kitchen, serving multiple dishes per course at dinner parties that lasted for hours. Dinner was often the highlight of the day and could last for hours. There were a lot of technical advancements in this era. This greatly reduce time and labor in the kitchen. 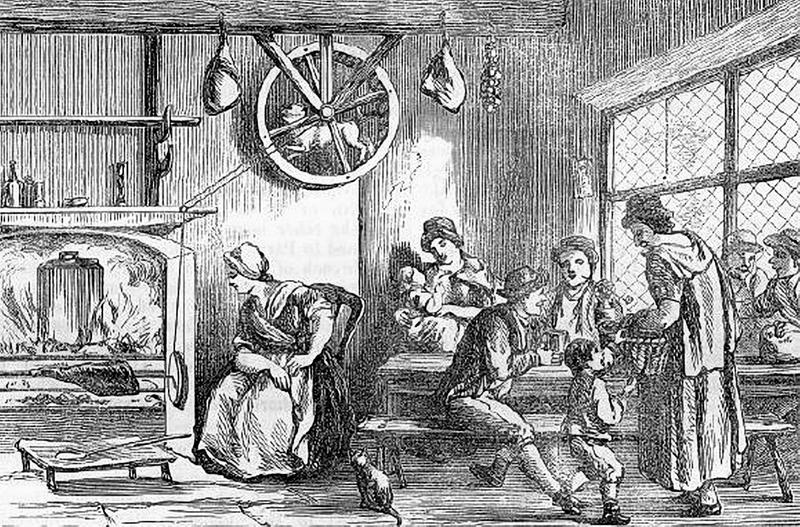 One of the most interesting of these being the turnspit dog (seen in picture #4). This was a dog that was specifically bred to run in what was basically a hamster wheel that spun a roasting wheel. This trend didn’t last for too long however, because other mechanisms that work similar to clocks were invented to keep the roasting wheel moving. A few more important inventions were the use of coal, gas, cast iron, electricity, and plumbing. These obviously had huge impacts on the kitchen. Cast iron stoves became a staple in kitchens around 1850, and were infinitely more efficient than cooking in a fireplace. Although kitchens became much more pleasant to work in during this period, people still did not entertain guests in this area, and there was little to no storage space. Gas became the preferred source of heat and the kitchen as we know it slowly began to take shape. Efficiency took hold and kitchens became more practical. Just before the turn of the century Hoosier manufacturing company revolutionized kitchens with their cabinets. This began the cabinet evolution that eventually led to the seamless contemporary cabinets of today. 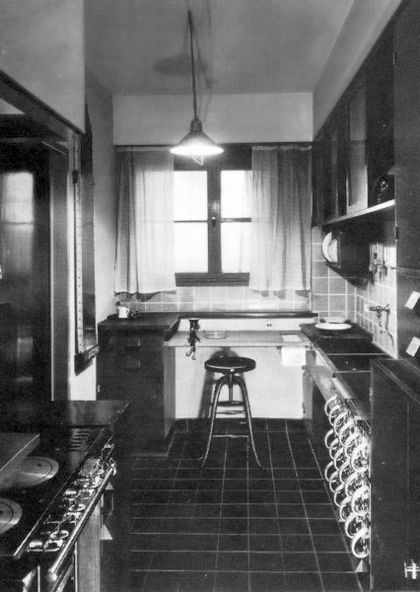 In the 1920s came the Frankfort kitchen, designed by a German named Frederick Winslow Taylor. His focus on organization and making sure that all necessary items were within arms reach changed the way people thought about kitchen design. 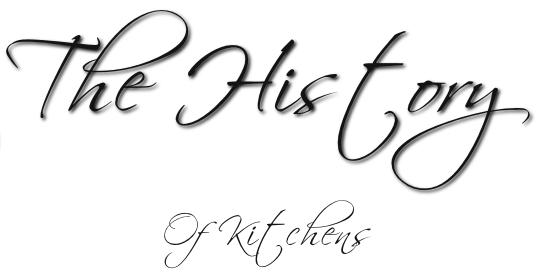 Another name for a Frankfort kitchen is a “fitted kitchen.” This is often used to describe a kitchen that was made in his style but not actually designed by Frankfort himself. This style blossomed during the 30’s and 40’s for those who could afford it. A fitted kitchen has cupboards, shelves, and appliances that are fixed in particular places where they fit exactly. Fitted cabinetry and appliances helped create a more intentional, attractive kitchen, and improved the workflow within the space. 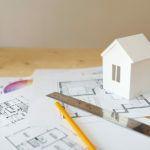 The invention of labor-saving devices, time-saving tools, more stylish kitchen designs made the space more comfortable, and a source of pride. With the war finally over and soldiers returning home we saw a large interest in home cooking, kitchen utensils, and entertaining guests. That combined with post World War 2 technological advancements had a huge impact on kitchen appliances. Quiet ventilation hoods, shiny ovens with matching refrigerators, microwaves, dishwashers, and designer countertops all became common place. Life was happening, once again, in the kitchen. 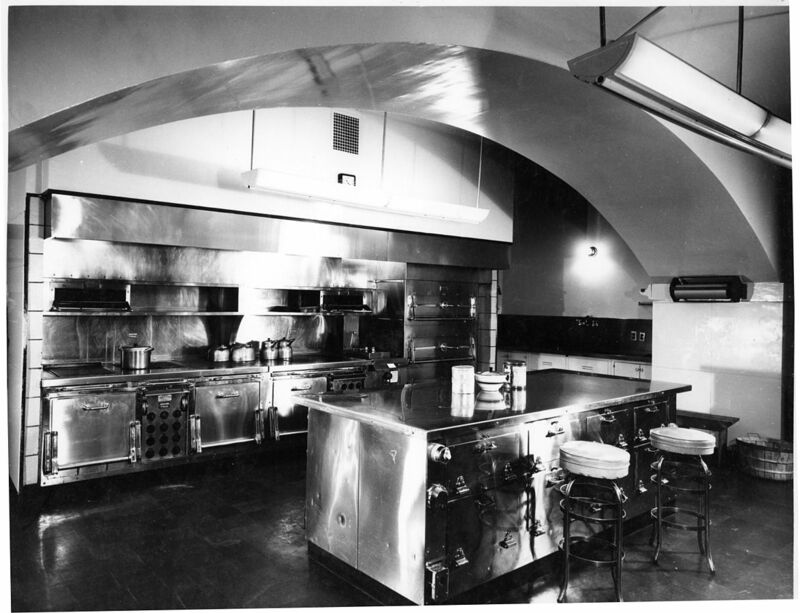 The kitchen became a source for honing culinary crafts, displaying designer cookware and served as the hub for social activity. By the 1980’s, the idea of a completely open kitchen, with appliances designed to show off, came into being. Thus giving birth to the trophy kitchen. A few trends from the 90’s were oak kitchen cabinets, brass lighting fixtures, white kitchens, ivy wall designs, black granite countertops, black and white tile, and hunter green paint. The 90’s saw a lot of self expression and individuality which carried over into the kitchen. 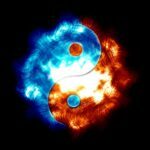 Zen Buddhism was growing in popularity and led to a lot of Japanese decor entering the American household. Simultaneously other folks we’re covering their kitchens with pine tables and pine cabinets. Decor varied greatly in this era but one thing most kitchens had in common was an L shaped working area. 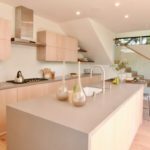 Kitchens these days may vary greatly from home to home, but there are a few trends dominating the current marketplace. Right now we’re seeing a lot of contemporary kitchens. A true contemporary kitchen elegantly blends beauty and function. As a result, we see a lot of cool colors, lots of cabinet space, large islands, and quartz countertops. As for cabinets design we’re seeing a lot of clean lines, veneers, and doors without handles. 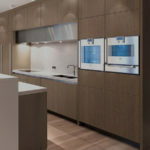 Below is an example of a contemporary kitchen that’s common to see in higher end homes. 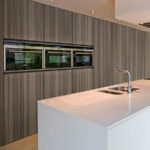 Notice how the cabinets are integrated with the wall and give a seamless appearance. The appliances are also seamlessly integrated into the wall. A direct evolution of the the Frankfort Kitchen. As years pass this space will evolve more. 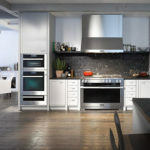 No one knows for sure what the next revolutionary innovation will be but it will be interesting to the next step in the history of kitchens.